I own quite a lot of bird field guides. Modern field guides are excellent but they just don’t have the entertainment value of the of older ones where someone has carefully drawn dead, possibly stuffed, birds in unfeasible postures, written something charming but not necessarily accurate about them, and then had the whole collection published using less than outstanding print techniques. Not to be outdone I have photographed some of my wholly inaccurate triangular paper birds interacting with sticks, and have written the facts that I know about them. Some of these facts are true, an awful lot of them are not. For instance, trees are made of metal and woodpeckers are made of magnets. I have printed these pages on some lovely A4 mottled paper and mounted them in dark charcoal mounts. I am explaining this because the first time I took these out into the world to a large craft event, people thought I had just cut some pages out of a real book and mounted them. Sometimes you can do something too well… So far I have written about house sparrows, blackcaps, starlings, song thrushes, greater and lesser spotted woodpeckers, wrens, and robins. This is what they look like all wrapped up in their cellophane bags. They look even better framed. 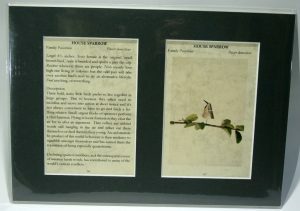 Click on the links below to see the mounted pages in all my characteristically scruffily photographed glory. Once there you can click on the picture to make it larger so you can read the ACTUAL WORDS!